Radio Flare Redux combines the thrill of deep space shooting with pounding techno beats to form an incredibly addictive game with stellar visuals and sound. Published by Chillingo and priced at just $2.99, I’d definitely recommend this game to anyone who enjoys trance music, breathtaking visuals, and killing things. Blurring the line between art and entertainment, Radio Flare Redux combines classic gameplay elements and unique visuals. The game is simple—control your ship with your left hand and aim/shoot with your right. To control your ship, simply press and slide your finger across the screen to move the ship. To target enemies, swipe your right finger (while holding down the ship with your left hand—this is important) over them; to shoot, lift your right finger off the screen. There is also the option of controlling your ship with a virtual joystick, but the finger controls are much easier and more intuitive. There are two variables that affect your score—your kill count and "the multiplier." To up your actual score, kill as many enemies as you can—if possible, kill them together (you get more points for combination kills). To up your multiplier, collect yellow dots that are left by your enemies as they die. 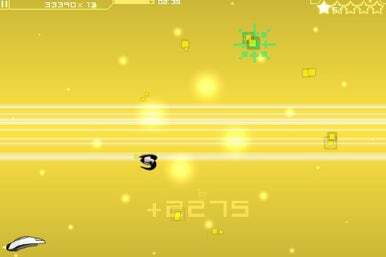 For each yellow dot you collect, your multiplier goes up by one (each time you hit an enemy, your score for that enemy equals the enemy point total multiplied by the combo number multiplied by the multiplier). If you die, though, your multiplier goes back to zero and you’ll have to build it up again. In addition to multiplier dots, are other collectible items to be had—including bombs, shields, and power-shot options. There are also unlockable levels that can be accessed by collecting stars. There are 33 planets in all, including boss levels. As fun as the game can be, the visuals of Radio Flare Redux are really the main selling point. Each level features pulsing, vibrant, visual effects that make you feel like you’re traveling through some sort of futuristic space-club. The animations, as well as the enemies, pulsate in tune to the beat, tying everything together nicely. Those of you who are sensitive to flashing lights be warned, though—if any iPhone game is going to trigger a latent epilepsy attack, it’s this one. Radio Flare Redux is simply a pleasure to play, and it’s challenging enough to keep you coming back for more. The levels are easy to finish but hard to master. The only real issue I found with the game was that you get a much better experience if you play with headphones—but the headphone jack is directly in the way of your left hand when you’re playing. Aside from this minor annoyance, Radio Flare Redux is still a pretty solid game.